English. Swahili was made a second official language in 2005 (Wikipedia). Indigenous languages are not specifically noted by name in law [verify] but their importance is recognized. Bernsten (1998) discusses some aspects of Ugandan language policy. Uganda is instituting a new bilingual education policy to begin primary education in maternal languages and transition to English after the 3rd year ("early exit" bilingual). The Latin alphabet is used. A few languages use some additional modified letters (extended characters) or diacritics. A chart showing the extended Latin characters and diacritics used in some Ugandan languages is available at http://www.bisharat.net/A12N/UGANDA-table.htm . 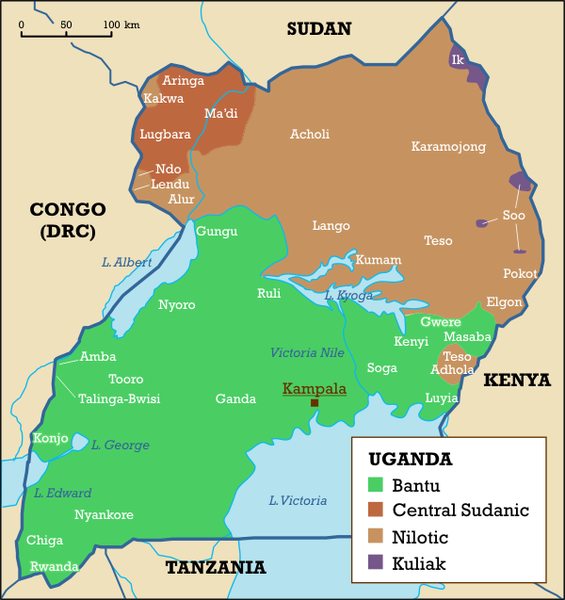 The issue of Swahili as an official language of Uganda is somewhat complex. It is not indigenous to the country and is apparently spoken by fewer people than English. The decision seems to be based largely on concerns of optimal regional integration in the East African Community (EAC) - Swahili has official status and is widely spoken in two other EAC members, Kenya and Tanzania. One might also add another factor - lack of content and user interfaces in the first languages of the people. The Global Learning Portal (GLP) has apparently had a project for providing information online to teachers in Uganda. A Mozilla web browser was localised in Ganda by ICT Translations - Uganda under the name of "Kayungirizi"